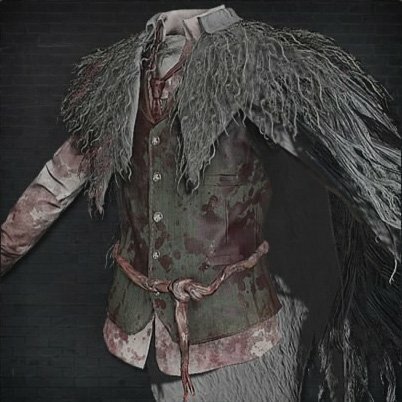 Beast Hide Garb is a Chest Armor/Attire in Bloodborne. It is part of Brador's Set and was added with The Old Hunters DLC. "The bloodied hide of a horrible Cleric Beast, pulled over the back. Without the attacked beast hide this foreigner garb wouldn't raise anyone's eyebrows. Jump down the bridge after fighting the second Brador. Look for the huge house with a lot of beams beneath it. Follow an obvious path into the house and take item bloodkin (10) and proceed back outside using the same way. This spawn Brador. This one drops Beast Hide Garb. The second brador didn&apos;t appear no matter what. Well..***** it...i think.